REDMOND, Wash. – Businesses around the world have already seen the impact of AI technology in digital services such as chatbots and virtual assistants. But how could this technology be implemented to the benefit of businesses based firmly in the physical world? Gurdeep Pall, corporate vice president of AI business for Microsoft Corp., spoke to this exact issue at Microsoft’s Azure Data & AI Tech Immersion. 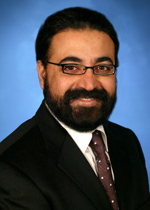 Gurdeep Pall, corporate vice president of business AI at Microsoft. Pall spoke about how Microsoft had to shift its approach from machine learning – in which an AI system will learn on its own by scouring data – to machine teaching – in which a subject matter expert can teach an AI system exactly what they want it to know so it can be applied the way they need. He says this will allow subject matter experts in any field to create machines and systems with AI to do what they require without any need to have an AI expert on hand. By using a machine teaching language that Microsoft has developed (but not yet released to the public), one can teach an AI system to perform a larger and more complex task by breaking it down into substeps and teaching it each of these one at a time; all the while having it monitor specific data points to ensure that the task is being accomplished as expected. Pall provided some examples of this process already being used in the world today. One such example was Royal Dutch Shell (commonly known as Shell) designing a self-operating oil drill which will avoid all unwanted substances (like sandstone) while optimizing the amount of oil it will yield without ever deviating farther than 2″ from its intended path. Pall emphasized the importance of this in an age where he says we are building infrastructure so quickly – due to technological advances allowing for more efficient productions processes – that we are unable to properly inspect it to ensure it is operating properly. And by teaching AI to operate drones as inspectors, he says we can ramp up the speed and efficiency at which we inspect infrastructure, for example, power lines or wind turbines. And this is something that Microsoft is working with companies (they were unable to name those companies) to develop; even saving money and resources by teaching its AI systems through computer simulations before applying it into the real world. “Can you imagine how one day we can have a lot of these systems with drones actually being able to do those things for you?” Pall asks. Machine teaching is still in development at Microsoft and is not yet commercially available. Microsoft was unable to provide a timeline for a release.